The main objective of this study is to present a two-step approach to generate estimates of economic growth based on agents’ expectations from tendency surveys. First, we design a genetic programming experiment to derive mathematical functional forms that approximate the target variable by combining survey data on expectations about different economic variables. We use evolutionary algorithms to estimate a symbolic regression that links survey-based expectations to a quantitative variable used as a yardstick (economic growth). In a second step, this set of empirically-generated proxies of economic growth are linearly combined to track the evolution of GDP. To evaluate the forecasting performance of the generated estimates of GDP, we use them to assess the impact of the 2008 financial crisis on the accuracy of agents’ expectations about the evolution of the economic activity in 28 countries of the OECD. While in most economies we find an improvement in the capacity of agents’ to anticipate the evolution of GDP after the crisis, predictive accuracy worsens in relation to the period prior to the crisis. The most accurate GDP forecasts are obtained for Sweden, Austria and Finland. 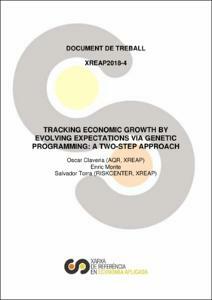 Claveria, O., Monte, E., Torra Porras, S. "Tracking economic growth by evolving expectations via genetic programming: a two-step approach". 2018.